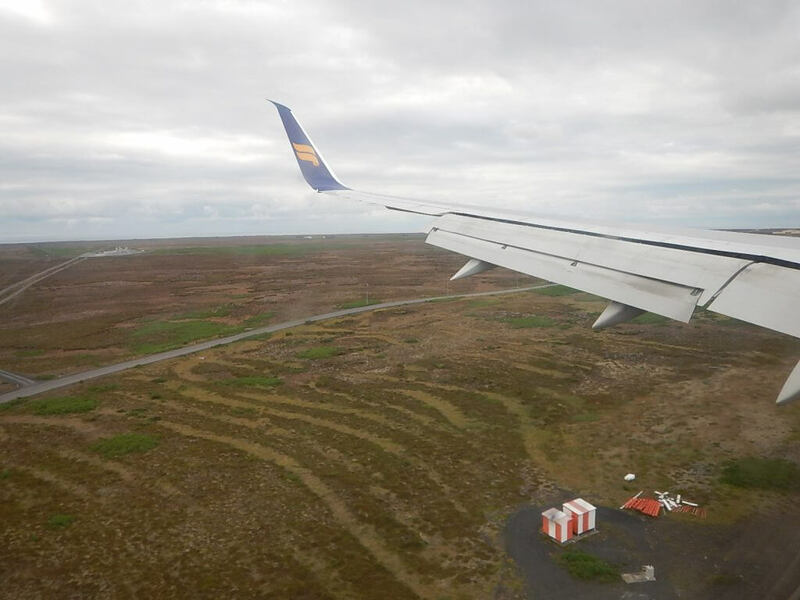 We stopped in Iceland on our way back from England on our way to New York, and made the trip with IcelandAir. I have nothing but good things to say about our experience with them; everyone was friendly and professional and incredibly helpful when they saw I was traveling alone with two little ones. The flight from England was just over two hours (from New York the trip takes just under five hours) so really just a short hop over the Atlantic. The major airlines that fly into Iceland will fly into Keflavik airport (KEF) which is actually about 45 minutes outside of Reykjavik, meaning you’ll either need to rent a car or look into transportation into the city if you’re staying in Reykjavik itself. We used Gray Line bus transportation and had a great experience with them. We were collected from the airport in a very comfortable coach (complete with WiFi) and taken to the Gray Line bus terminal, where we transferred to a smaller bus that could more easily navigate the streets of Reykjavik. When making your reservation, you can give them the name of your hotel, and we were dropped off right outside. On our trip back to the airport, we chose a pickup time and were collected right on time, again from in front of our hotel (a quick note: when choosing a pickup time, remember that 45 minute transfer time and give yourself a little extra wiggle room; Keflavik airport does take some time to get through!) Prices run around $25 per person one way, although that can obviously fluctuate with the exchange rate. Iceland is the hot destination right now, and Reykjavik in particular is the place to go. New hotels are popping up all the time, but the city does seem to be struggling a bit to keep up with demand, and hotel rooms are booked well in advance. We didn’t book our hotel room until a couple of months before our trip, and I was really surprised at how few options we had; I’d literally look a couple of days apart and find hotels had suddenly sold out. Additionally, many of the hotel rooms only slept two people in twin beds; when I searched for a party of three, even with one of those three being a baby, many of the options disappeared. In the end, we booked a twin bed room at the Fosshotel Baron and requested a crib or pack and play for Gray. 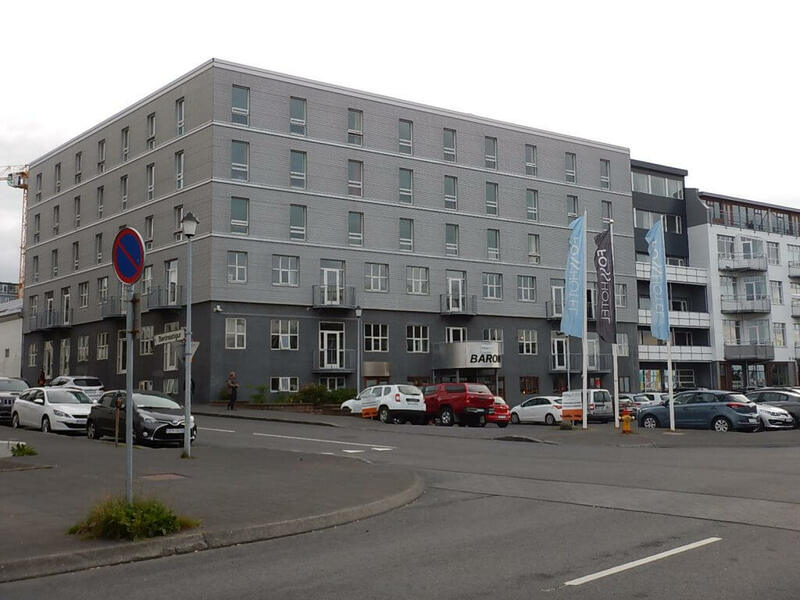 We really liked this hotel; the price was reasonable (at least for Iceland!) and the location was perfect for us; right across the street from the water, a short 15 minute walk from the Old Harbor area, and just a few minutes from the city center. The rooms were more spacious than I had anticipated, and we had no trouble fitting a pack and play for Gray as well as our twin beds (which they had actually pushed together to make a good sized bed for Harrison and I to share). All of the hotel employees spoke perfect English and were very friendly; all were happy to offer suggestions on places to eat and the best way to get around (free maps of the city were available at the front desk). The room came with a free breakfast buffet that we took advantage of; there were cold options such as meats, cheeses, fruits, and yogurt, as well as hot choices such as eggs, sausage, and a waffle machine to make your very own waffles! A hot breakfast to start our day was just what we needed to brave the chilly weather before we set our exploring. We arrived into Reykjavik at 6pm on a Thursday, and left at 10am on the Saturday, leaving us one full day to see as much as we could. 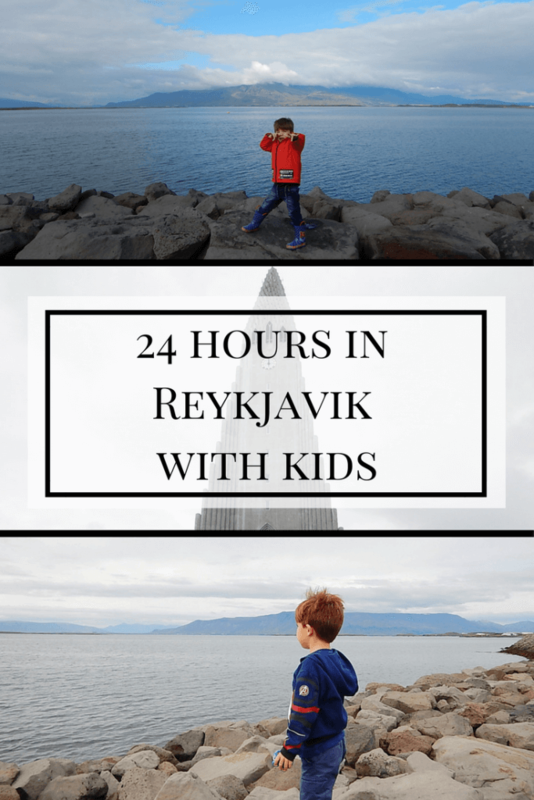 We had two choices; either we could stay in Reykjavik and see the city, or we could rent a car and spend a full day driving around seeing as much of the country as possible. In the end, one day to see a whole country, even just the highlights, seemed crazy, especially traveling with young kids who would need to stop every so often. I decided we would spend the day in Reykjavik itself, and see as much as we could. Note: If you do want to try and see a little more of the country but you’re not keen on renting a car, consider a Best of Iceland tour; these feature the most popular destinations but save you from having to navigate the roads of Iceland in a rental car! 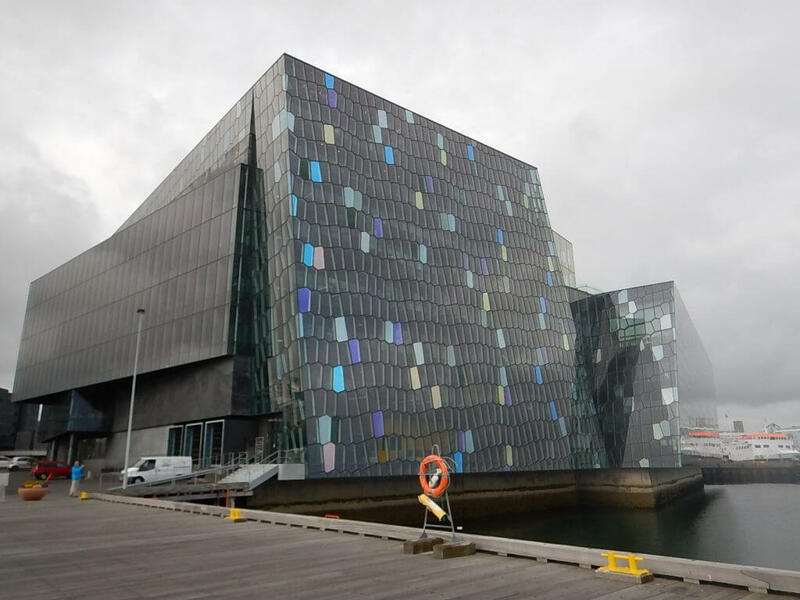 We started out day early with a walk along the water towards the Harpa Concert Hall, one of Reykjavik’s most notable landmarks with a facade made from colored glass. We were lucky to have mostly gorgeous weather on our trip, with temperatures in the low 60’s and mostly sunny skies. The walk was beautiful, overlooking the ocean and the mountains in the distance. Harrison loved climbing on the rocks that lined the water, and we had fun watching the local runners and cyclists out making the most of the gorgeous weather. We even spotted some jellyfish in the water around the concert hall. One of the the other landmarks I wanted to see while in Reykjavik was the Hallgrimskirkja Church. 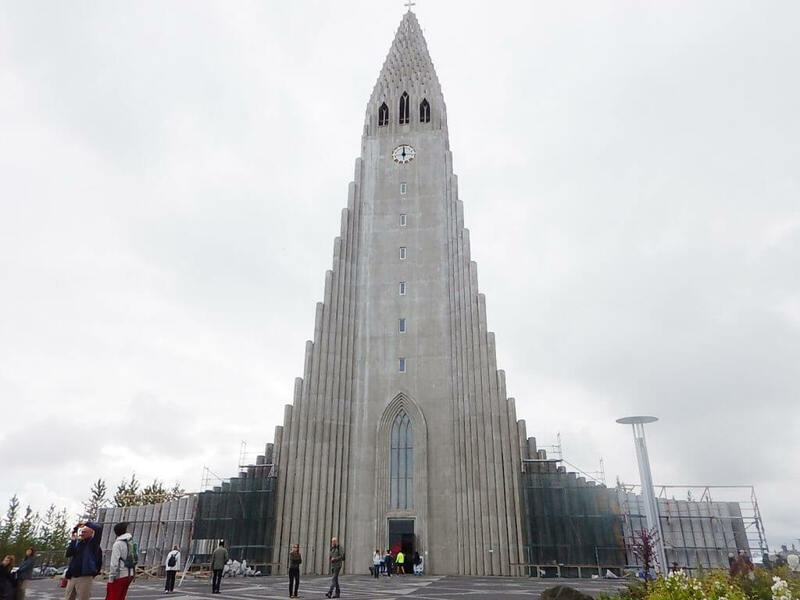 It is a Lutheran church that stands at 244 feet high, making it not only the tallest church in Iceland, but one of the tallest structures in Iceland. We kept spotting the top of the church from our walk along the water, and I decided we had to go and see it up close. The walk from the Harpa Concert Hall was around 30 minutes, but that was pushing a stroller up and down the hilly streets of the city (and ‘encouraging’ a slightly unenthusiastic 4-year old to walk a little quicker!) The church really is impressive when you’re standing in front of it; the architecture is breathtaking, and I would love to have gone inside to explore further if I hadn’t had the two kids with me. I would definitely recommend stopping by to see this while in the city. The number one thing I wanted to do whilst in Reykjavik was to go whale watching. I was a little overwhelmed with all of the choices available to me, but ended up going with Special Tours after reading a fantastic post by Tamara at We3Travel (I would highly recommend checking out the other posts on Iceland on her site, I found them incredibly helpful!) Special Tours was suggested for trips with young children due to the boats having bathrooms and a cafeteria, making them very family friendly (and bonus, kids under six are free!) The fact that the kids were free meant that this didn’t end up being too pricey for us all to go – and I didn’t feel too bad when both of them fell asleep within the first 15 minutes of the 3-hour trip! The captain of the boat was very knowledgeable and chatted to us as we sailed out to the feeding grounds where whales and dolphins were most likely to be found, although we had our first whale sighting within the first half an hour of the trip. We saw multiple minke whales, both in the distance and closer to the boat, but my favorite sighting was a pod of very friendly dolphins who kept swimming under the boat! We kept a respectful distance from the animals at all times (unless they approached us) and if too many other boats were near one of the whales, we moved on without stopping so that they weren’t overwhelmed. Although it had been raining when we boarded the boat, the weather was beautiful out at sea, with extremely calm waters. It was so exciting for us all to be stood watching the water and for a tail to pop up, or to see a blow in the distance. Harrison was so excited to see his first whales in the wild, and loved being out on the boat. As well as the whales and dolphins, we saw multiple puffins flying past the boat and different species of sea birds. 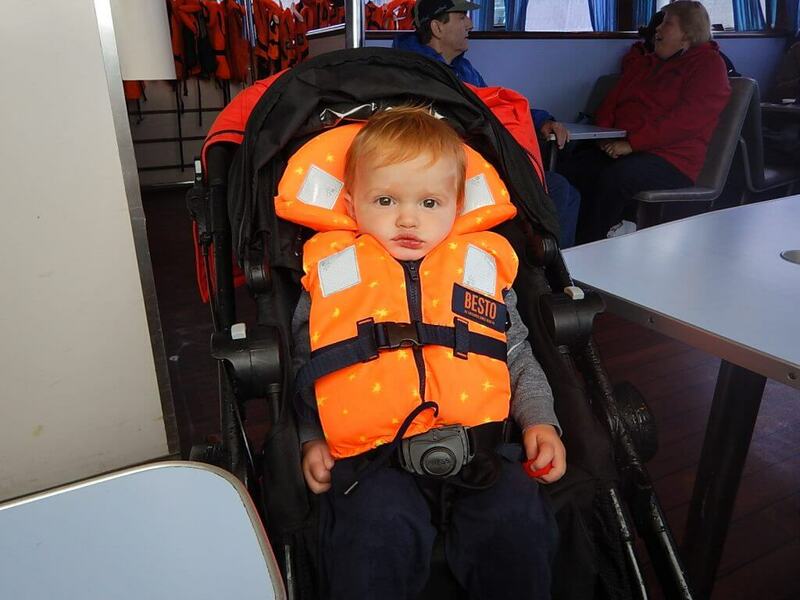 All children under the age of 12 had to wear a life vest (which is something to take into consideration – Gray was not a happy baby in his life vest!) and there are warm overalls available for everyone to wear if they wish so they can stand out on deck comfortably. All in all, this trip was the highlight of our stay in Reykjavik, and I’d love to go again to see what other animals could be spotted. After our whale watching trip, we stopped for dinner before walking back along the water to our hotel. I was really pleased with what we accomplished with our one day in Reykjavik; it was a fantastic taster of what both the city and Iceland itself have to offer. I knew that eating in Iceland would be a bit of a challenge; I was traveling with a child who likes his food very plain, and a baby that eats more than most adults do. I pictured bribery for one child, and spending a fortune on the other! Fortunately, you can find menus for many of the restaurants in Reykjavik on line, giving you an idea of how much you might be spending and what exactly is on the menu. In the end we found the food wasn’t all that different, and there were options both my kids were happy with. 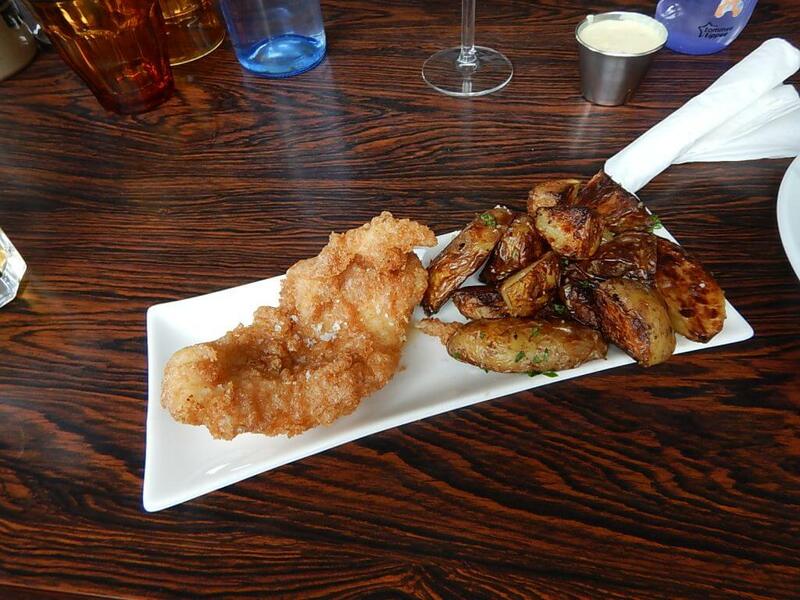 Our favorite place was Icelandic Fish and Chips in the Old Harbor area; the fish was fresh and perfectly cooked, and the chips (more like roast potatoes than classic chips) were well seasoned and delicious. We ordered one adult portion, one kids portion, a glass of wine and a kids drink, and the total came out to around $50 with the current conversion rate. Not exactly cheap, but it was plenty of food for the three of us and the quality was excellent. My other recommendation when traveling with picky eaters is a place called Aktu Taktu, which seems to be an Icelandic version of McDonalds. This place had burgers, fries, and most importantly for my 4-year old, chicken nuggets. I was surprised at how good the quality of the food was considering it was really just fast food, but it was definitely more expensive than any McDonalds you’d find in the States! One thing I do want to highlight is something we learned on our whale watching excursion, and that is that most people who live in Iceland don’t really eat whale. When researching the trip, I saw whale on the menu at several popular restaurants, and assumed it was a local delicacy. I always like to try native foods when I travel to new places, and although I didn’t think I particularly wanted to try whale, I could see how tourists would assume that it was something the locals ate. In reality, the people who eat the most whale in Iceland are in fact the tourists, and the locals are trying hard to ban whaling, as Iceland is one of the few places where the custom is still legal. Our boat captain told us that we as tourists could do our bit to help by choosing restaurants that pledged not to serve whale on the menu; many of these (such as Icelandic Fish and Chips) had a sign on the door to the restaurant that read “meet us, don’t eat us” which let you know that whale wouldn’t be served there. We had the most fantastic time in Reykjavik, and I think we did a good job of seeing as much of the city as possible in a short period of time. 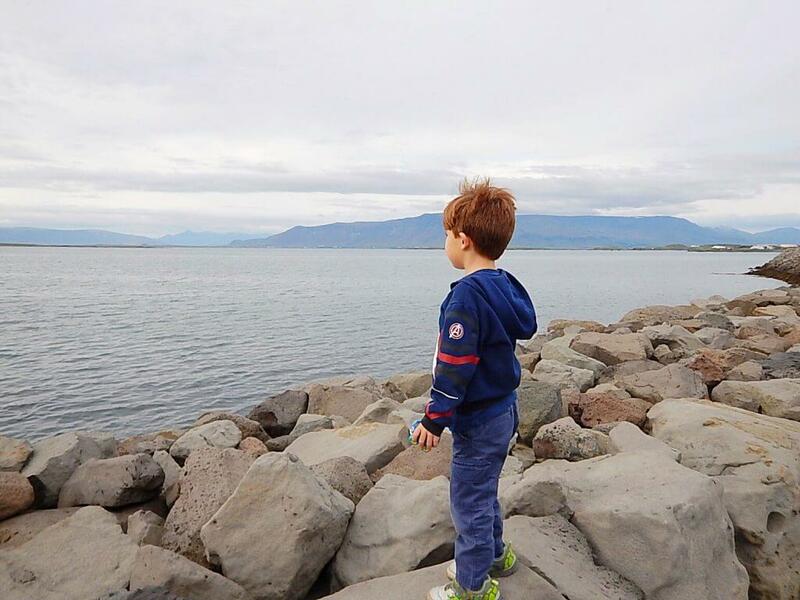 I was surprised at how much my little ones enjoyed Iceland, and what a family friendly place it turned out to be. We would love to go back another time to see more of the country, as this little taster trip definitely showed us that there is a reason everyone is flocking to Iceland! Book your trip to Reykjavik HERE. Have you been to Reykjavik? What did you do with your time there? Let me know in the comments! that all sounds so great. good tip on booking hotels far in advance. It amazed me how far in advance they were booked up; I assume this will improve as hotels continue to be built, but it certainly makes finding last minute accommodations tricky!